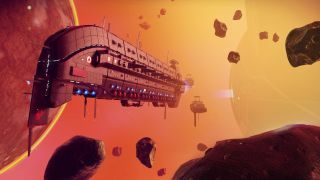 No Man's Sky, the space-exploration sim that promised a near-infinite number of planets to hop around, finally has a release date for Xbox One. After releasing for PC and PS4 in August of 2016, the game will finally hit Microsoft's console on July 24. Landing with 4K resolution options and all the updates previously available on PS4 and PC, the so-called "NEXT" update seems to finally make good on the game's hoped-for multiplayer promise. You'll be able to team up with other players, building structures together, remaining permanent for all other players to see. You'll also be able to take part in space battles together and create customisable race tracks. Murray stated that the game will continue to get similar sorts of substantial updates "for the foreseeable future," and though you can probably expect the features to roll out to the other rival platforms as well as Xbox, he unfortunately fell short of confirming that news – this is unsurprising, given the Xbox-focused nature of the Microsoft-run show. It's been a long old road for No Man's Sky, which amazed gamers with its near-infinite freedom ahead of release, but fell short initially of giving them something substantial to do with all that space. Finally, it seems, the game everyone saw in their heads is now the game they'll actually be able to play, too.